Thorough, kind, communicated clearly and repeatedly checked for understanding and if I had any questions or concerns. It was simple to book and a great first appointment. Just the right amount of care shown whilst also being efficientand to the point, which I appreciated. It was simple to book and a great first appointment. Just the right amount of care shown whilst also being efficient and to the point, which I appreciated. Dr. Thang Nguyen welcomes new patients! Dr. Nguyen has been practicing for over 15 years. He is a thorough, detail-oriented primary care and family physician treating both adult and pediatric patients. His approach to treatment emphasizes patient education about disease processes and general health and well being. He holds certification from the American Board of Family Medicine. Dr. Nguyen obtained his Bachelor's of Science Degree in Biochemistry and Molecular Biology from the University of Wisconsin, Madison. 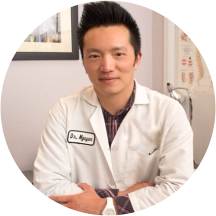 After his undergraduate program, Dr. Nguyen pursued his medical degree from the University of Wisconsin, Madison, School of Medicine and graduated with his Doctorate of Medicine. He continued his medical education at the University of California, San Francisco where he received his residency training in the Family and Community Medicine Program. Patients visiting Dr. Nguyen can receive a full range of medical services. He provides complete physical exams, general medical consultations, as well as treatment for specific illnesses and issues. If you need a refill of a controlled medication, such as pain medication, sedative or ADD/ADHD medication, we will need to obtain your medical records from your previous physician. Super nice, accommodating, and professional. Looking very forward to ongoing primary care from Dr. Nguyen and staff! I loved how Dr. Nguyen seemed to care about my overall health, and not just treating the ailment I presented with. For the first time, I left a doctor's office happy! Always the most considerate and attentive doctor I’ve had. Very caring and looking out for your best interest. I’ve been seeing Dr. Nguyen for a couple months now and he has always been a delight! Never waited over 10 min to be seen, he is a great listener, and he provides comfort when I have concerns. Highly recommended! Great doctor, patient, kind and caring. I found my new primary care doc! Dr. Nguyen is a thorough and caring doctor. His office is clean and beautifullly decorated. Highly recommend him. Didn't seem very confident. Didn't communicate well. Don't think I'll go again. Very kind doctor. More professionals need his calm demeanor. Dr Nguyen is a great doctor and a very nice guy, highly recommended. Thanks Thang! I am visiting my family from out of town and having been battling a flu....I found Dr. Nguyen nearby. A wonderful doctor who takes the time for new patients to review your medical history and then address your concerns and answer any questions. I highly recommend. Felt scammed! Went there as part of my preventive care. Because he asked additional questions (which I thought were part of the preventive care consultation) he billed more to my insurance. At the front desk, they weren't honest about it either. Great doctor! He takes the time to talk to you, understand your circumstances & get a holistic view of your health. Great doctor. Very nice and knowledgeable. A good doctor in a small clinic. No complaints. Friendly manner, helpful, and eager to help me with each of my issues. Explained ways to improve my wellbeing and listened carefully to what I said. No wait time at all. Thank you! He was relatively thorough. Although I’d appreciate it if he would do a more thorough exam and take his time going through the motions. Also, some explanation for the he treatment would have helped. Great doctor, helped me figure out what I needed to do and the vaccinations I needed! He seemed very thorough and I'm hoping he made the right diagnosis and I'll feel better soon. The doctor really takes time to listen to you and give you what works best for your body! My 2nd physical exam in over 4 years and compared to the other primary care doctor, my experience with Dr. Nguyen was great! He was thorough, listened patiently and checked for every thing. I'll return for future medical needs. Very friendly, patient, thorough - really glad I met and am consulting with him for my checkup needs! As other reviews have stated, he was very professional and thorough. Would recommend for anyone looking for a no-frills doctor. Awesome and thorough doctor. It was not a quick appointment, rather, Doctor Nguyen went through all the motions thoroughly without any rush. He listened to my needs and provided the answers I was looking for. Dr. Nguyen was very thorough in going over my previous medical and family histories. He explained each step he was taking in my medical care and how/why it related to me or to the tests that he was ordering. I will definitely return. Very professional doctor and extremely nice. Definitely wants to make you at ease and fix you up. Front end staff was also very nice and attentive. Very happy to have found this great doctor! Doctor Nguyen is very patient and kind, ask me lots of question and make sure to cover everything. Was thorough, polite and professional. He even went the additional mile and tested me for other things than the purpose of my visit and got me labs and Rx to address those things. Dr. Nguyen was very thorough in his examination. His manners were very pleasing and overall the experience was very fruitful. My first appointment was great! He was very attentive and sounded like he cared about why I was there. I'm going back in a month. Dr. Nguyen took me last minute while I was visiting the bay area for a week long business trip. He was engaged, concerned, amazingly capable and runs a clean, calm, and comforting practice. Thank you Dr. Nguyen for such exceptional compassion and care! Dr. Nguyen went over my lab results and made suggestions to get me healthier. Dr. Nguyen was knowledgeable and he answered all my questions and made sure I was comfortable and took the time to go through all my concerns. Never once did he rush me. He was very very sweet, it was super comfortable and personal. Thang was thorough, patient, and addressed all of my concerns. Good doctor and kind person. Office staff was friendly and helpful. Would definitely recommend!